A router like the DeWalt DWP611PK Compact Router Combo Kit is specifically made for that kind of work and eats edge profiles and a long list of other tasks for breakfast. It has dual LED's and a clear base for improved visibility. The electronic feedback circuitry lets the router adjust to the workpiece. Bit changes call for just one wrench. Soft start motor helps prevent accidents. It does not come with a hard case, a centering cone, and a dust collector, which are staples for other routers. If your shop were a classroom, a router would be that silent student who shocks you every now and then by doing things you did not know they could do. Indeed, a router is one of the most versatile woodworking tools, taking care of tasks from simple round-overs and decorative trims to big and complicated projects. Finding a router is not a problem because there must be hundreds of models and combos to choose from. Buying the right router is the issue. We put this guide together to get rid of that dilemma. Working on a home renovation project a while back, we had to make a table that had what we later learned was a French Baroque edge profile. It seemed simple and easy to do when we were brainstorming for the project but we found ourselves clueless when it was time to make it. We were able to figure it out eventually and thought we did a pretty ingenious job using a DIY scratch stock. Later on, we found out about routers and realized what tools (pun intended) we had been while building that table. The DeWalt DWP611PK Compact Router Combo Kit is for the average woodworker who mainly does minor routing projects and wants a durable and versatile router kit handy. Its variable speed control ensures a smooth and safe cut for virtually any workpiece. It even has a feature that makes it easier for you to change bits easily and quickly. Meanwhile, we recommend this product for small routing projects because those are what palm routers do best. You can use them to forge small dovetail joints, trims, hinge mortises, edges, slots, cutouts, and decorative inlays, just to name a few. Finally, the DeWalt DWP611PK Compact Router Combo Kit has a sturdy aluminum motor housing and base. These routers should last a long time provided you do not abuse it. Routers have either single-speed or multi-speed control. If you can, find a router with variable speed control so you can produce the best results safely. For example, cutting at a speed that is too high relative to the bit size can cause stress and vibration on the bit, creating burn marks on the wood. On the other hand, if your speed is set too low, you may end up with a jagged cut. Low speeds are recommended for large bits while high speeds are safe enough for small bits. For making quick and smooth cuts, you need a high speed, a low torque, and power up to around 2.5 hp. For heavy-duty jobs or large-scale production, you are better off with motors 3 hp and up. Palm routers are best used for rounding off edges, cutting small profiles, dadoes, and joinery, and doing other minor routing work with smaller profiling bits. They are affordable and powerful. They are so compact they can fit in one hand (hence the name “palm router”) or stand on the edge of a table for trimming edges. Compact routers typically use 1.25 hp or less and are limited to ¼ in shank router bits, making them inappropriate for bigger projects. Many woodworkers like mid-sized routers best because of how these routers balance flexibility and ease of use. These tools can do everything palm routers can, plus two-handed operations involving anything between moderate to big profiles. You can use them for circle cutting and making bigger dovetails and panels. Mid-sized routers use around 1.7 hp to 2.25 hp of power and are capable of using ¼-in and ½-in shank bits. The other good thing about this class of routers is that a huge chunk of aftermarket accessories are specifically made for them. Using up to 3.25 hp motors, large routers are powerful machines for removing a lot of material quickly and accurately. This makes them perfect for use with large profiling bits for big or heavy-duty projects such as raised cabinet door panels. Full-sized routers are often used on a router table for production operations of any size. Unless you desperately need that much power, a large router may be too big and heavy and may even turn out to be a disadvantage. Fixed-base routers are called such because you can’t plunge the bit into the wood for a deeper cut. You will have to reset the motor to do that. That does not make fixed-base routers any less useful, though. In fact, they can do a wide range of depths. A fixed-base router typically has knobs you guide the router with. However, they are often also mounted on a router table but only for edge routing work, dovetailing, and other operations that call for guide bushings. Unlike fixed-base routers, a plunge-based one can be plunged (duh) into the wood away from the panel’s edge to make a deeper cut. You do not have to reset the motor. You simply unlock a knob that controls the depth stop system then raise or plunge the motor housing. A plunge-base router can do everything a fixed-base can, plus anything that requires plunging. It is the router of choice for jobs such as mortises, dadoes, and blind grooves. This compact router combo kit comprises of a fixed-base and a plunge-base router run by a 1.25-hp motor. You can use these tools to make quick and simple cutting, joining, and profiling work. They have variable speed control and a no-load speed range of 16,000 to 27,000 rpm, making them compatible with just about any bit size. Finally, both routers have LED’s and a clear, precisely machined sub-base that lets you see the work area underneath and center the bit more easily. Although palm routers are restricted to using ¼-in bits that can be safely run at top speed and do not need speed adjustments, they can burn wood if not cut at the right speed and fed at the right rate. Generally, dense and oily wood such as cherry and maple burn easily so you have to set your speed lower and feed more for them than you would for sturdier wood like oak. With the right combination of speed and feed rate, you should be able to avoid burning your workpiece. You can ease into even the most delicate cuts with these routers’ soft start feature. Instead of blasting to the selected speed right after powering on, the motor will slowly accelerate to the preset speed. This means there will be no sudden jerk that can screw up your cut. The full-time electronic feedback constantly monitors the motor’s load and automatically adjusts the router’s speed to match the former. The router’s motor adjusts to your pace and your workpiece, instead of the other way around. As a result, the router cuts at a constant speed despite a changing load. This feature guarantees that your router will not suddenly break down if it’s suddenly made to make a difficult cut. With dual LED’s and a clear, extended sub-base, you can see the work area and make precise cuts easily. There is a large, low-pressure spindle lock button that holds the motor shaft as you tighten the collet with a wrench during bit changes. This means you do not need two wrenches to change bits, unlike the case with other routers. An improvement like this is not too big of a deal but it still helps a lot. Since this was going to be our first router kit, we took the time to go over some product reviews online. Most of the feedback were positive, ultimately convincing us to order the kit. However, many customers shared our complaint that the kit did not come with common router accessories such as a centering cone, a hard case, and a dust collector. However, those did not really mean that the routers performed any poorer. In fact, those people said they would keep on using their DeWalt palm routers and might even buy additional ones. All in all, this palm router kit appears to be a good compact tool for any woodworker with light routing needs. This router set from Makita boasts of an “ultra-quiet motor” and has a speed range of 8,000 to 24,000 rpm, which is much wider than the DeWalt routers’. 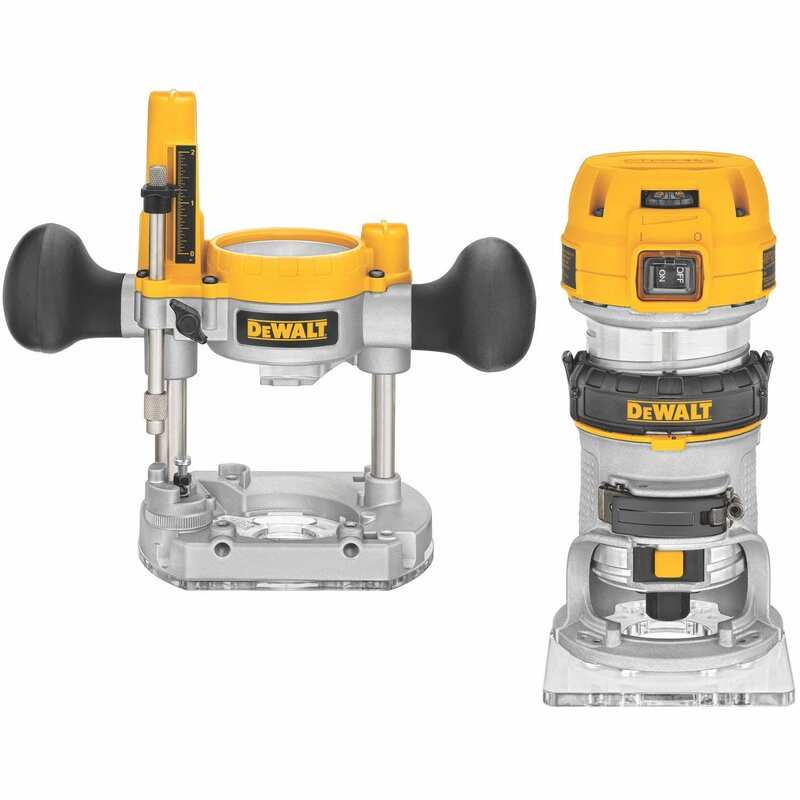 It also has a durable aluminum motor housing, a flat top design, a soft start motor, and a depth control ring, similar to the DeWalt combo kit. In addition, it has a ball bearing construction, externally located carbon brushes, and nickel-plated plunge poles that help resist corrosion. Bosch’s router combo brings what it calls a micro-fine depth adjustment to the (router) table. It is unique in that it has wooden knobs on the fixed-base router to allow for a more stable cut. The plunge-base router has soft-grip handles that let you ease into plunges more smoothly. Its speed range is 8,000 to 25,000 rpm, which is also a lot bigger than that of the DeWalt combo kit. Its higher hp means you can use it for bigger bits and bigger projects too. With a motor noise level of 79.5 dB, Hitachi promises a quieter shop with this router combo kit. Its motor’s release clamp has two stages, allowing for precise depth adjustments and quick switching between bases. One of the things about this combo kit that stood out for us was the 30-money back guarantee, which says a lot about the manufacturer’s confidence about the quality of their product. If that is not enough to convince you, they offer a 5-year warranty too. If you are not quite feeling like getting a variable speed router kit, this combo from Porter-Cable has a fixed speed of 27,500 rpm. Its fixed-base router’s height can be adjusted with its cam lock lever, which also takes care of coarse motor release. Depth adjustment is also extra-fine. We are talking micrometer-level precision to 1/128 in on the fixed-base router. The plunge-base, on the other hand, has an adjustable turret (six positions) that allow for effortless step plunges. Like the DeWalt compact router combo kit, this other competitor from Bosch has LED lighting that is always turned on for constant visibility. Furthermore, the trigger-control system can be easily manipulated by the operator through the power switch located in the handles of both routers. Similar to the DeWalt routers, these products have a spindle lock, variable speed control, and fine depth adjustment settings. It has a 15-amp motor that cuts at 10,000 to 25,000 rpm. Trust us. You need a router more than you think you do. That makes it all the more important to invest in a good set (or piece, depending on what kind of work you do). DeWalt’s DWP611PK Compact Router Combo Kit comes with a list of features that have your and your work’s needs at their core. Its adjustable speed gives way to a clean cut while the soft start motor feature reduces the likelihood of injury. The electronic feedback mechanism makes the router adjust to you so you can focus more on your work. Finally, it makes routing just a whole lot easier by maximizing visibility through the use of dual LED’s and a clear sub-base and a spindle lock that enables single-wrench bit changes.